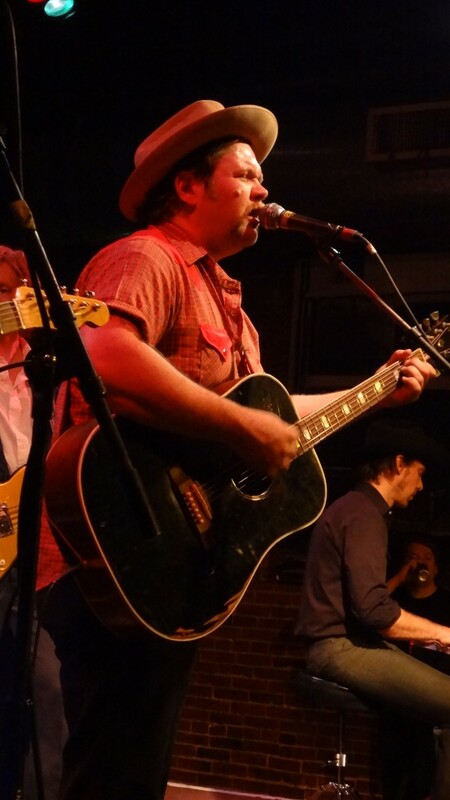 Ole Tinder opened strong and started the set with “Ride Out Of Here” which immediately set the tone for a blue ribbon night of country music at The Tractor Tavern. 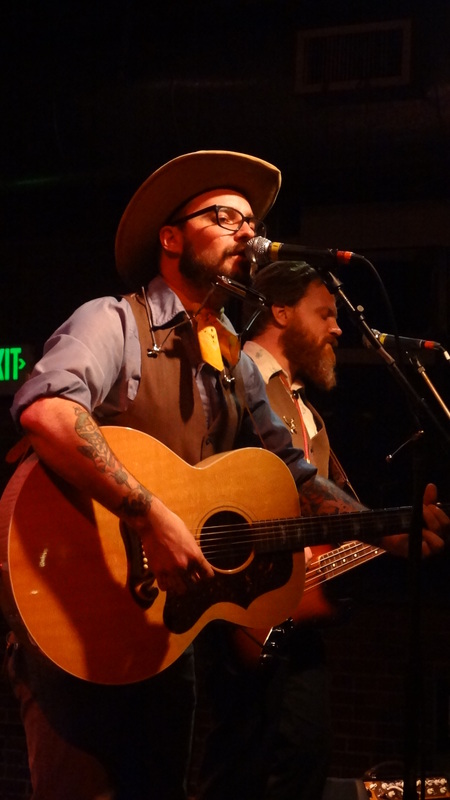 Their look is old-timey, down to their hats, scarves, vests and thick beards. 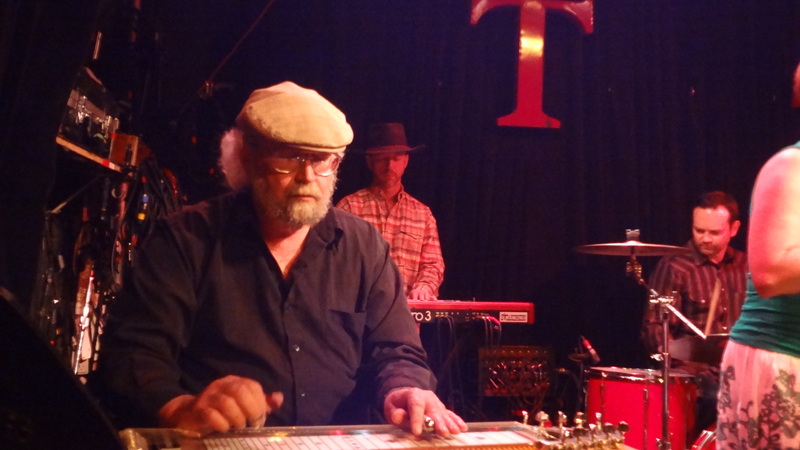 Ole Tinder’s classic sound is achieved with the mournful whine of pedal steel from J. Kardong and tender cowboy harmonies from Mike Giacolino (vocals/acoustic/harmonica) and Nils Peterson (vocals/bass). Pat Schowe kept a nice two-stepping beat on drums and switched out sticks for brushes adding a softer touch. Ole Tinder’s twelve-song setlist included most of the songs from their latest EP Loways and several others that were equally enjoyable. 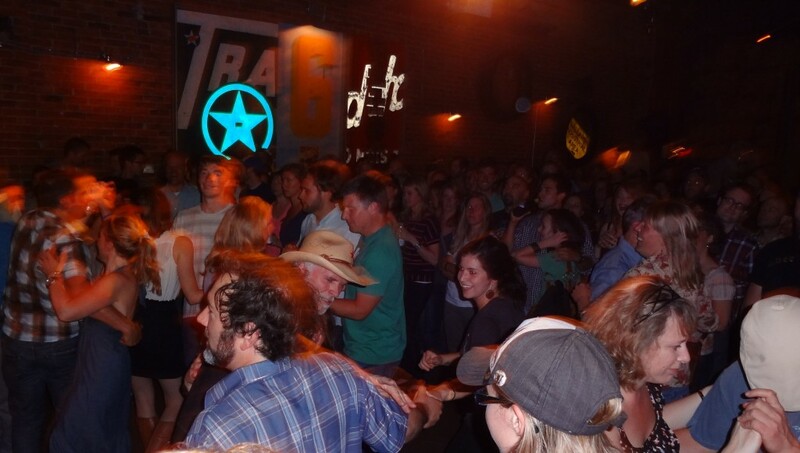 The Tractor neared capacity, but the audience backed away from the stage several feet. I’ve witnessed this strange phenomenon repeatedly. If the audience isn’t familiar with the band, they shy away from the stage; it’s like they do not want to invade the band’s personal space. If the band is headlining, they crush up to the front. The dancers were taking full advantage of the empty space in front of the stage during the faster songs. Throughout the set, Mike G. tried fire up the audience. He asked how they were doing, or said, “You guys still with us?” and expected a loud response in the form of a whoop or cheer. If they didn’t respond accordingly, he asked them again until he was satisfied with the decibel level. As the evening wore on and Ole Tinder earned their spurs, the crowd increased in volume every time he checked in with them. 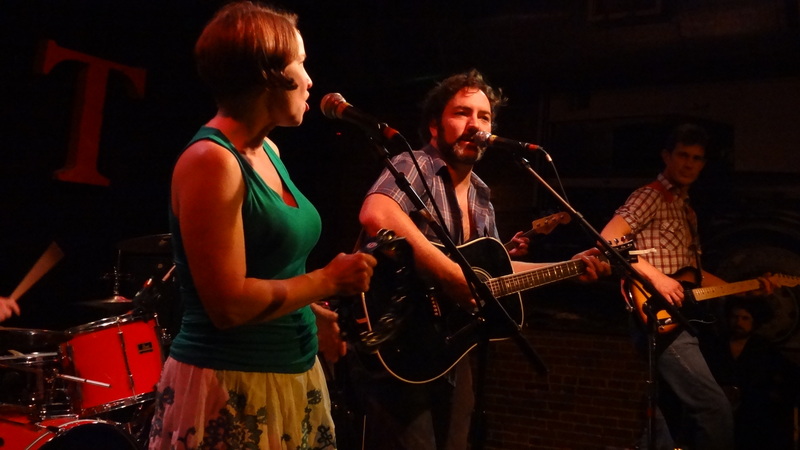 Most of Ole Tinder’s songs kept the growing crowd moving and dancing to a faster beat, including “Our Hope” found on their new EP. As Ole Tinder progressed through the setlist, the audience grew more and more attentive, although the loud chatter sometimes won over their singing during quiet numbers. A few songs were waltz-worthy in three-quarter time. Their fifth in the setlist, “Broken Light” contains the lyric, “That’s what whiskey is for” repeated throughout the solemn song. Another, “Aurora Bridge” rang closer to home and contained allusions to Seattle’s infamous suicide bridge. The lively closing song, “A Welcome Home” induced more dancing. The floor was packed by the end of the set, and the rowdy crowd was liquored up for The Swearengens and Davidson Hart Kingsbery. The Swearengens, celebrating their CD release, Devil Gets Her Way entered the stage as the loopy and happy crowd whooped and hollered. The Swearengens’ name hails back to the Gold Rush days in Deadwood, South Dakota. 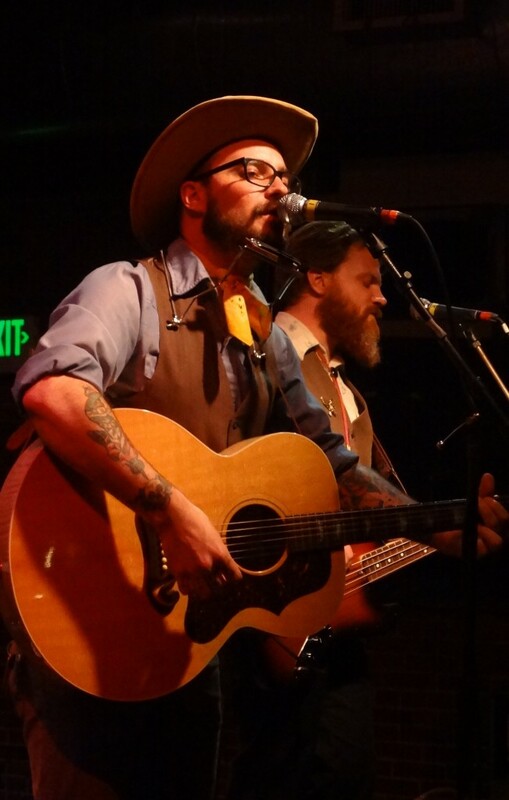 Its seven talented members, led by Fredd Luongo, joined together about a year and a half ago and built a formidable wall of whiskey-infused alt-country music. They started the set with “Bundle of Joy” and followed with “For A While”, and the dancing crowd crushed to the front while the standers backed away to make room. “Devil Gets Her Way”, the title track from their new CD was warmly received. Fredd dedicated “Bloody Gloves” , a killer song (pun intended), to Mike G. of Ole Tinder. Someone brought whiskey up to the stage. Fredd Luongo drank his down and shouted, “Where’s my tally, Lisa?” I told him before the show we’d have a 1:1 ratio of band:writer whiskey consumption with the goal of producing a favorable review. We agreed to keep a whiskey tally going for as long as possible. I believe I “lost” after the first 5 minutes of the set, but I told him I would do my best to give them a decent review anyway. The review and I would have been nonexistent had I tried to keep up with the band. Each musician had their time to shine on various songs. The large band includes Brigitt Rains (vocals and tambourine), Fritz Marial (bass), Brian Ochs (drums), Fred Slater (keys) and Soren Godbersen (electric guitar). 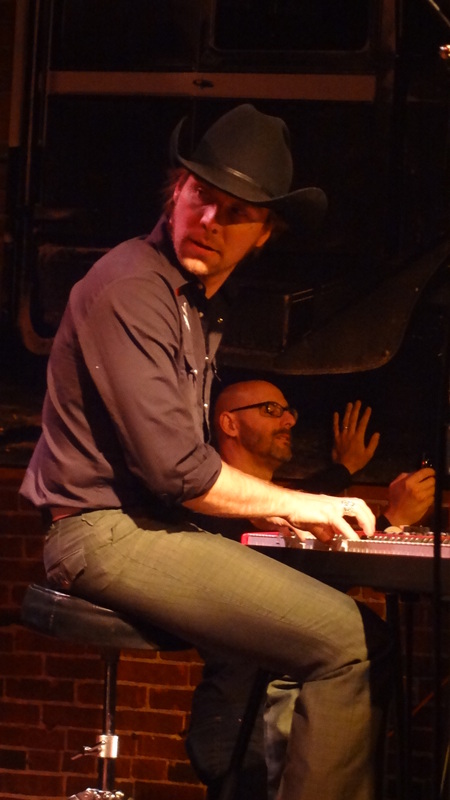 My favorite musician of the night was Country Dave Harmonson on pedal steel guitar. I stood near him and got to witness this man’s amazing talent. 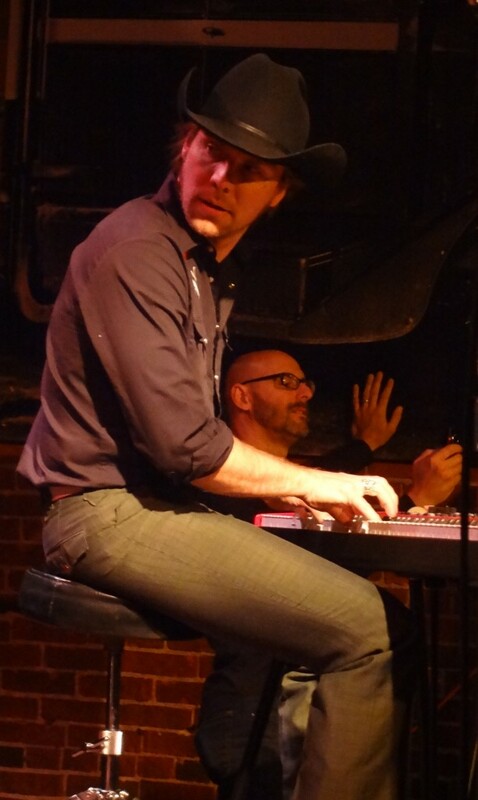 He had a gorgeous custom Sho-Bud instrument straight out of Nashville. 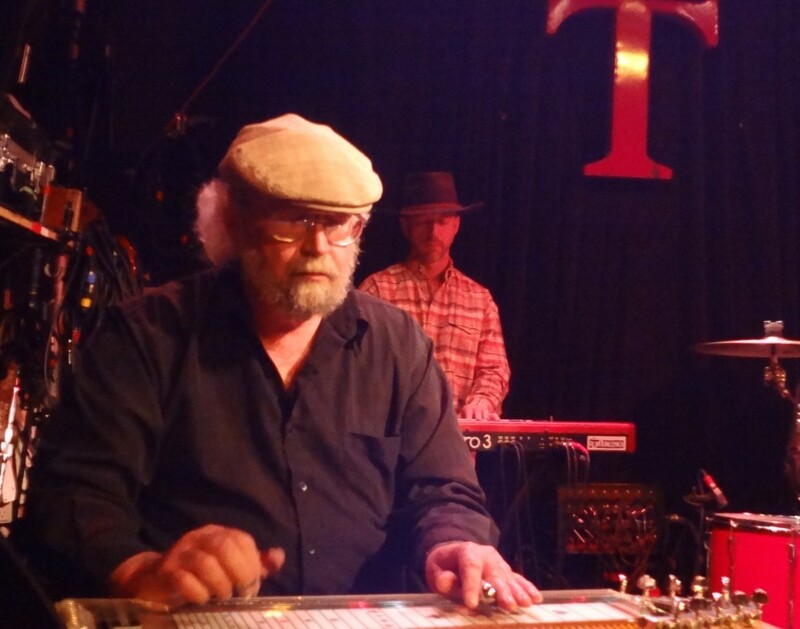 I’ve never seen a better pedal steel guitarist. He held the last note, emphasized phrases and chords and performed complex runs. He is a master and a treasure to this community. On a fun Waylon Jennings cover called “I’m So Thankful”, Fredd invited guest guitarist Aaron Starkey to help out. He then dedicated “Freeborn Man”, the last song of the night, to Country Dave. Fredd set his guitar down, jumped into the crowd, grabbed a girl and started dancing. 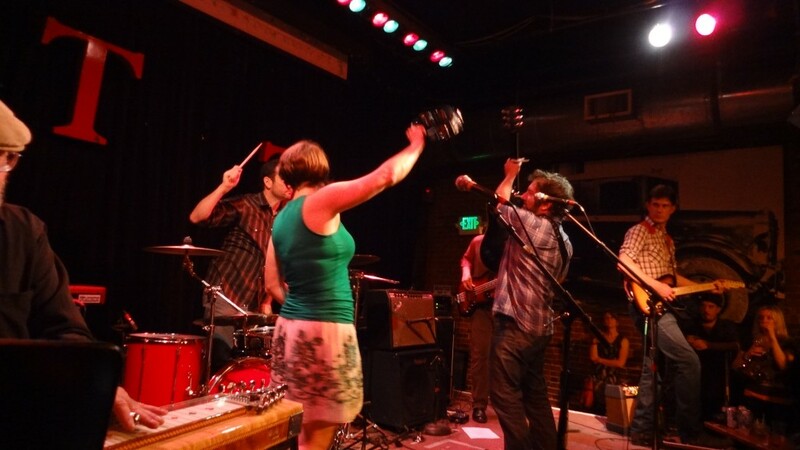 Brigitt followed, and in a little more ladylike fashion, found her dancing man while the rest of the band continued playing. They twirled around in a joyous moment. The audience gave them room and joined in on the fun. Eventually they jumped back up and finished out the song. It was a wonderful way to end The Swearengens’ evening and get the crowd fully primed. 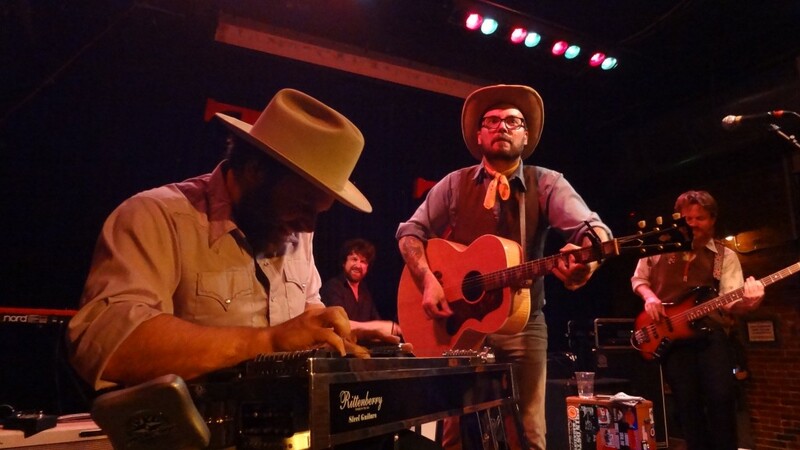 DKH’s sound is straight-up country with a honky-tonk chaser. Band members include Dean Johnson on lead guitar, Eric Hines on bass and Ben Strehle on keys. Judging by the packed house, people stayed to party with this band. 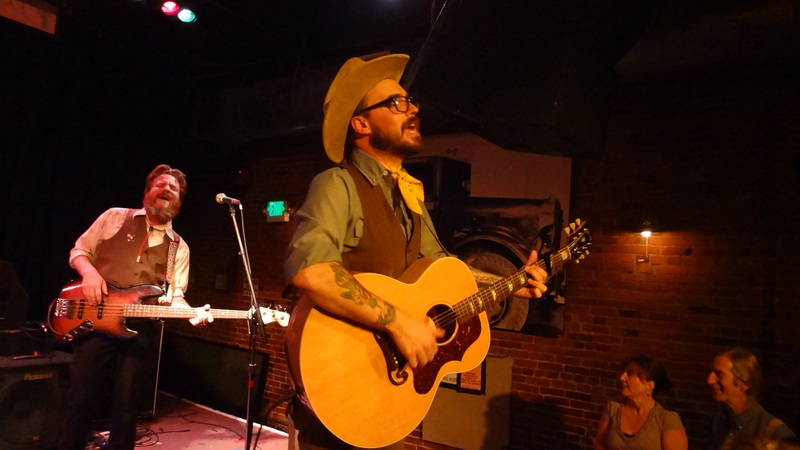 At one point, frontman Hart lost his hat in a more animated moment while belting out a song. Unfortunately, I had to leave early and did not get to witness their entire set, but I heard the drinking and dancing were in full swing by the end of the night. I found out later that the show was completely sold out. 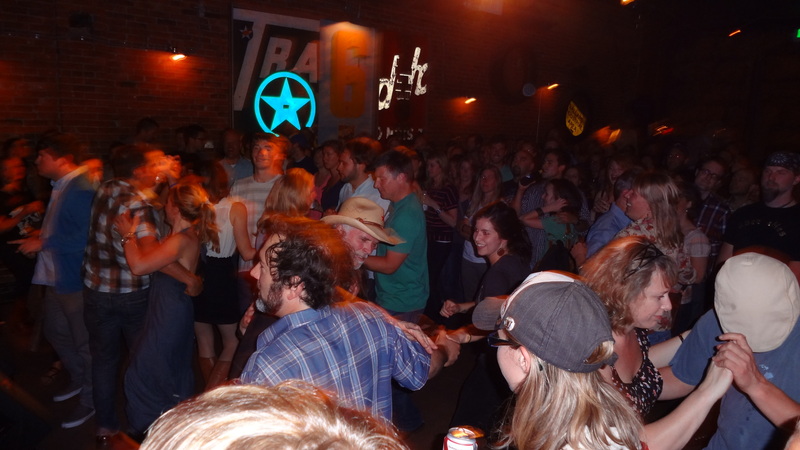 Fritz Marial of The Swearengens described the dance floor as something akin to a full-contact, two-stepping mosh pit–a good indication of a blue-ribbon night!